The passenger pigeon went extinct on this day in 1914 at a Cincinnati zoo while the Cubbies came back to beat the Reds. Our lives are made up of a series of events that seem obligatory but are in actuality activities designed to pass the time in an existence that lacks exterior definition or direction. We attend cookouts on Memorial and Labor Days, go to uncomfortable Thanksgiving dinners with relatives we don't know, drive to the store to buy milk or socks or laptop computers, and we watch baseball. Whatever else happens, wherever it happens, from the start of exhibitions in March until the last out of the World Series in October or sometimes November, there is a baseball game going on. The National Pastime is not just a diversion but the white noise of our lives. One September 1, 1914, the last passenger pigeon that would ever live perched in a zoo in Cincinnati counting down the final moments of its existence. Once the world's most abundant bird, with single flocks that numbered a million or more individuals, in the space of mere decades its population had dwindled until all that was left was this solitary female, called Martha. Who can say what the last member of a species thinks as it contemplates the ultimate mortality, even if it is only a pigeon? Is its loneliness any more profound than it would have been otherwise? There was also a baseball game in Cincinnati that day. The Reds hosted the Chicago Cubs at Redland Field. It was not a contest of any great import. The Cubs were 62-57, only four games behind the league-leading New York Giants, but in fourth place. They wouldn't make a run of it. The Reds were 54-63 and in seventh place, 11 games back. It was a good game, a seesaw affair in which the Reds got out to a 4-2 lead after two innings, but the Cubs kept battling back and finally jumped ahead for good with a three-run seventh due to what the Cincinnati Enquirer called "some clever bunting"—the Cubs loaded the bases on an infield hit and two bunt singles and then scored their runs on an RBI groundout and a two-run ground single up the middle. The final score was 8-7. There was a future Hall of Famer playing in Roger Bresnahan, who went to Cooperstown as a catcher but manned second base for the Cubs that day. Chicago's first baseman, Vic Saier, drove in three runs; he isn't well remembered now, but from 1913 to 1915 he was the Deadball version of Anthony Rizzo, until he simply forgot how to hit. 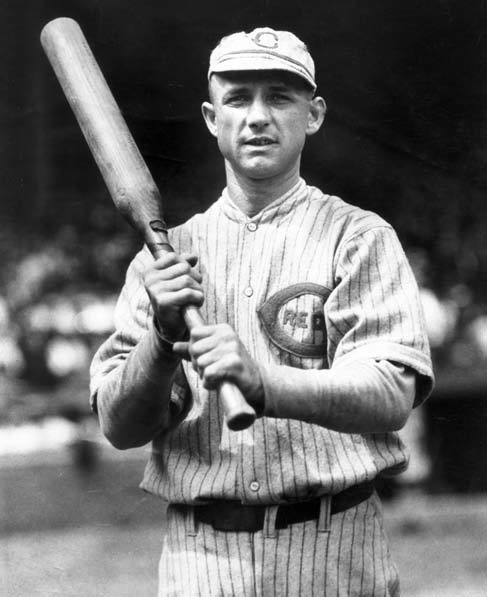 The Cubs got another three RBI from third baseman Heinie Zimmerman, who had the two-run single in the seventh. He was a good hitter who led the National League in RBI three times, but would eventually be banned from baseball for fixing games. Later in life, he'd be an associate of the mobster Dutch Schultz. The Enquirer reported that he nearly refused to play after discovering his paycheck was $200 light, the missing money having been deducted to cover fines for an on-field fight and two ejections. The Cubs' starting pitcher was named Jimmy Lavender, which isn't particularly significant except that he goes in the pitching crayon box with Vida Blue, Bud Black, Whitey Ford, Rick Greene, and Red Ames—the last named having started the game for the Reds. Ames was relieved by King Lear. It's counterintuitive, but King Lear is even more obscure than Vic Saier is. Fred "Wildfire" Schulte played left field for the Cubs. When the season was over he was looking forward to going home and tending to his cotton crop. The Reds' starting second baseman was Heinie Groh. A .292 career hitter who spent most of his career at third base, he is, to this day, famous for using a "bottle bat", so called for its unusual shape. Even though he never made the Hall of Fame, it's easy to remember a player with such a distinctive trademark. The bottle bat has probably led to more discussion of Groh than of certain extinct animal species. Passenger pigeon flocks were once so large that one passing overhead could block out the sun. John James Audubon wrote of one that took three days to stream by. If a flock landed in a tree, the boughs would bend or break. There are many stories like this; the birds were impossibly numerous. And yet, even they could be hunted and eaten and deforested away. Martha, along with a male, George, was the last survivor of a captive population. There would be no offspring. According to a recent book, after George died in 1910, "Martha spent four years as a melancholy zoo attraction. Visitors tossed sand to get her to move." At some point on September 1, 1914, most likely while the Cubs and Reds played nearby, Martha died and the passenger pigeon vanished from the Earth. The attendance for the September 1st game was not reported. The Reds were last in the league in attendance, with just 100,791 coming through the turnstiles all season. Their average crowd was 1,309, but this was a Tuesday, so it was probably a good deal less, maybe just a few hundred. Just like their present-day descendants, these souls were living in the moment, doing the things we do to fill out the days. Heinie Groh is long gone now, and Wildfire Schulte, too. Watching them that day in 1914, though, it must have seemed like they would be around forever.